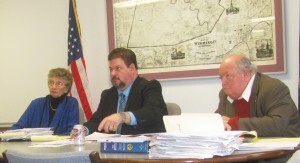 Wyoming County Commissioners (from right) Ron Williams, Tom Henry, and Judy Mead listen to a statement by clean air advocate Audrey Gozdiskowski (below) on January 27. 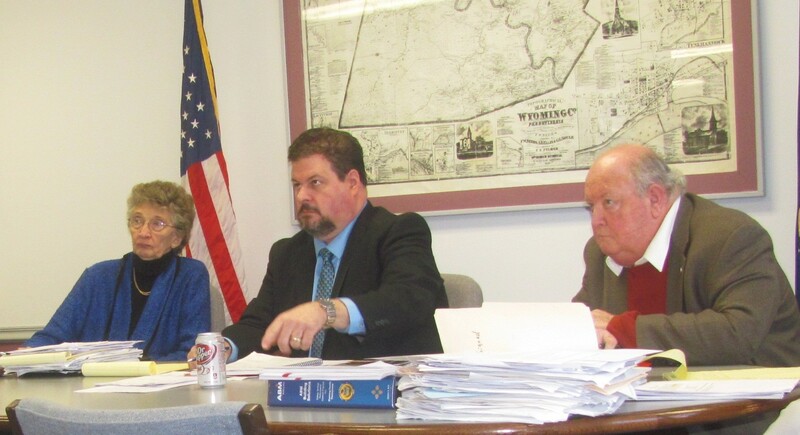 Ongoing heated public exchanges between the Wyoming County Commissioners and regular adversary Audrey Gozdiskowski are beginning to reveal a tangible divide between Republican Commissioners Tom Henry and Judy Mead and sole Democratic board member Ron Williams. Gozdiskowski’s charges, while drawing scrutiny for both credibility and relevance to matters at hand, have presented curious questions that the commissioners seem unable to answer. 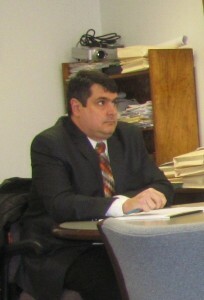 While it appeared two weeks ago that a tentative approval by the board of a contract between Wyoming County and Dr. Tim McCauley of CHANGE had appeased clean air advocates, Gozdiskowski vowed to continue the fight for more comprehensive testing and to prove that Henry has misrepresented the county’s role in zoning and other industry-related matters. The commissioners voted unanimously on Jan. 13 to pay McCauley $7,500 to consult with them on a study conducted by DEP, contingent on the approval of the language of the CHANGE contract by County Solicitor Paul Litwin. Henry announced on Jan. 27 that the cost for McCauley’s services could now be as much as $25,000. A more clearly defined contract sent by Litwin to McCauley resulted in the air quality specialist requesting more money from the county. Litwin related that he modified the document into a “prime contract,” which specified what the county would expect of McCauley at his $200-per-hour consulting rate. Primarily, Litwin cited “reviewing data and documents” associated with the impending DEP study and “reporting that information to the commissioners” – elements of service directly corresponding to what the commissioners had said on Jan. 13 would be covered under the $7,500 fee. Williams questioned several letters, reports and emails that Henry cited in association with the new arrangement with CHANGE. Henry said that he had forwarded the emails to Williams and that they must have been missed, a suggestion to which Williams took offense. Henry’s announcement followed public commentary by Gozdiskowski, including news that she had filed a claim with DEP in Bradford County on Jan. 20 against the Tran-Z sand transfer facility in Wyalusing. Despite numerous tests and independent studies done in the past at the site, Gozdiskowski (below) insisted that she witnessed numerous discharges of silica during the loading process between train cars and waiting trucks and that she took readings with an air monitor that showed “dangerous” levels of particulate matter often associated with silica sites. Gozdiskowski also repeated her claims that Henry has been dishonest with the public when discussing what the county is capable of doing in terms of preventing construction of certain types of facilities and whether impact fee disbursements can be used for equipment and services related to air quality testing. Henry interrupted Gozdiskowski several times to tell her that he intended to put a time limit on her speech, which she read from a notebook. When she ignored him, Henry abruptly left the meeting and called Sheriff Ned Sherman to the room, as Henry had threatened to do in the past. 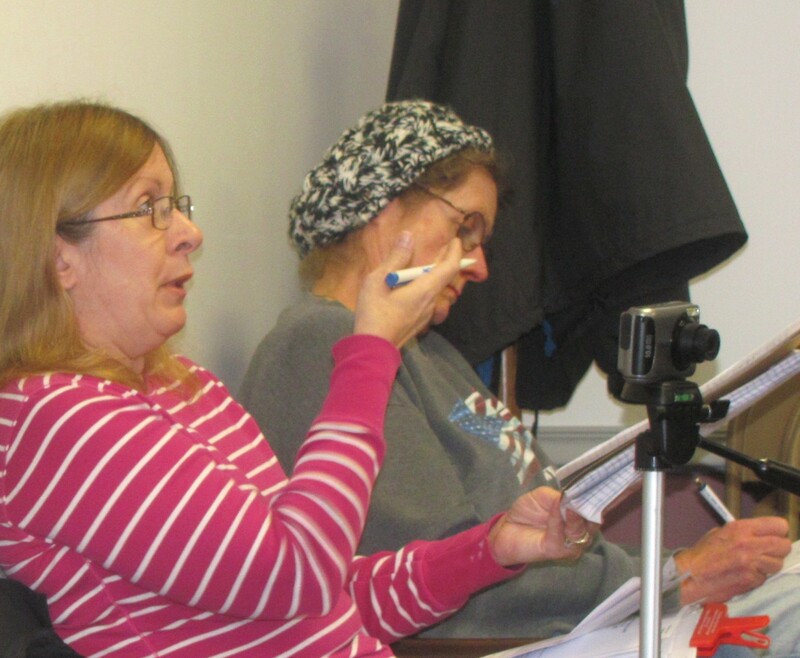 “I don’t want the public to think that we haven’t done anything about this, because that’s just not true,” said Henry, explaining after the meeting that a new air monitoring station has been constructed in Tunkhannock Township near Bartron Supply by DEP. It will likely be activated within a week for a planned 90- to 120-day sampling of weather conditions and air quality. Results of the “base test” will be compared to another round of testing after the silica depot has been constructed and is in full operation. The EPA, Henry added, will review the scope of the project, including the sampling plans, as well as the data produced by the tests. 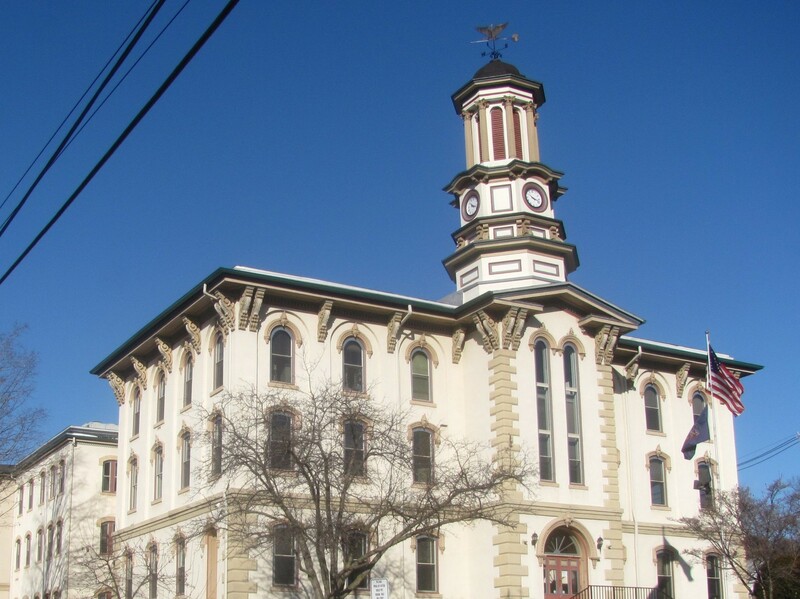 The previous $7,500 contract was declared null and void since the solicitor had rejected it. The commissioners unanimously approved the new, more expensive deal with CHANGE. Williams was pleased with the new contract, having been more willing than Henry and Mead at previous meetings to vote for a comprehensive study by McCauley and his team. DEP did NOT install a new Air monitoring station……it’s a weather station (which is a waste of taxpayer $ because there’s already a weather station @ Emergency Bldg on Rt6. (although THAT is not hooked up to a computer) WBRE had a DEP person say it would run for 10 mos BEFORE an Air Monitoring study would begin.